A perfect appetizer for any cajun party. These deep-fried battered rice balls are crunchy on the outside, moist & spicy inside. Tasty southern Louisiana smoked andouille sausage, boudin balls & choice of gumbo, red beans & rice or jambalaya. Guaranteed to get your mo jo working! These moist & tender barnyard beauties are just right for dipping. Slightly spicy shrimp dipped in a rich tasting amber ale beer batter & brushed w/ Louisiana sauce. A hearty blend of tampa red’s own chili & cheese w/ just enough of the red stuff to give it a little heat. A generous platter of tortilla chips layered w/ hickory smoked pulled pork, pit beans, chili cheese dip, sour cream & chives. Whole smoked chicken wings marinated & brushed w/ our famous Louisiana sauce. A great sampling of our shrimp, smoked chicken wings, rib tips, Italian sausage & battered fries. We make all our soups from scratch using fresh vegetables & our own smoked meats. Ask your server for today’s feature. Slow smoked chunks of beef burnt ends simmered w/ fresh garden vegetables & sprinkled w/ parmesan cheese. Soup of the day or burnt end soup & half of a beef, ham, turkey or pulled pork sandwich on white bread. Our slow‏ simmered, not too spicy, hearty beef & bean chili served w/ your choice of onions & or cheddar cheese. From top to bottom, this three-layered delight will satisfy any BBQ lover’s craving. 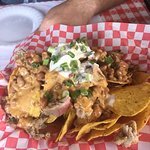 Hickory smoked pit beans, creamy coleslaw & succulent pulled pork. 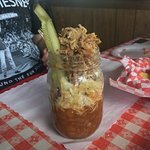 Served in a mason jar & topped off w/ sauce & a pickle spear. 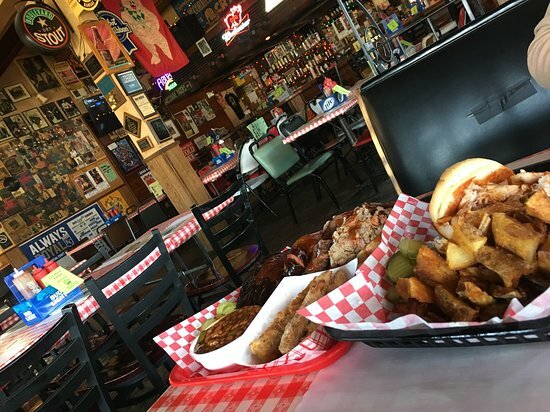 All of BB’s lawnside BBQ’s sandwiches are served w/ skillet fries or battered fries. 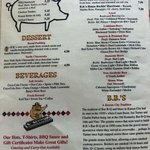 Plus, BB’s has BBQ sandwich lunch price chopper shopper rewards specials available all week. A hearty mix of chopped beef, ham, turkey, pulled pork, Italian sausage & burnt ends marinated in our own sweet BBQ sauce on a big sesame seed bun w/ battered fries & pit beans. 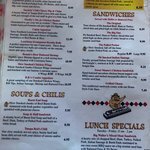 Your choice‏ of hickory smoked beef, ham, Turkey or pulled pork on white bread or bun w/ battered fries & a soft drink or iced tea. 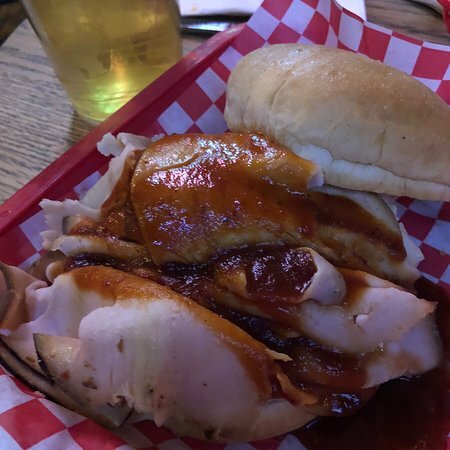 Your choice of pit smoked beef, ham or turkey thinly sliced & piled high on white bread or a bun. Pit smoked beef, ham or turkey thinly sliced & piled high on three pieces of white bread or a sesame seed bun. Freshly ground Italian sausage link prepared by McGonigle’s, smoked at B.B.’s & served on a hoagie bun. Hand battered succulent chicken breast topped w/ BBQ sauce & melted mozzarella cheese on a big sesame seed bun. This traditional sandwich comes w/ our homestyle cole slaw. An 8″ flour tortilla packed w/ jambalaya & gumbo, smothered in mozzarella cheese & topped w/ sour cream & chives. A spicy & sassy tomato based stew w/ chunks of smoked chicken, ham, turkey & sausage. Stick to your ribs fare. Slow cooked w/ smoked ham hocks, onions, celery & peppers served over white rice. A traditional south Louisiana dish combining ham, sausage & chicken In a pot full of seasoned rice. 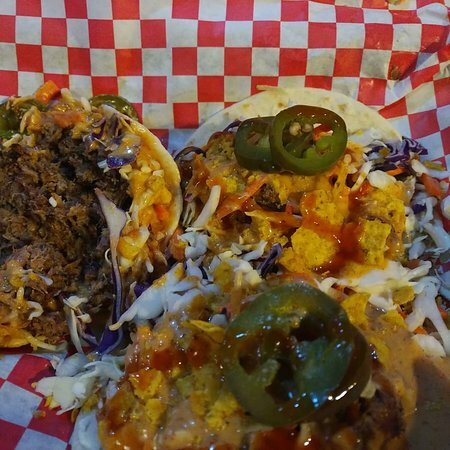 Our three “Louisiana favorites” layered together on a platter & sprinkled w/ file powder. Served w/ a sourdough roll. 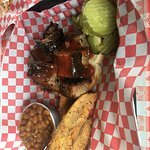 A quarter smoked chicken w/ three ribs served w/ battered fries. 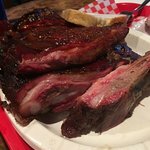 Four ribs, Italian sausage & your choice of beef, ham, turkey or pulled pork. 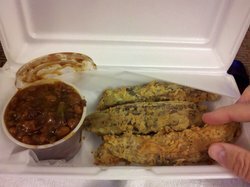 Served w/ battered fries & pit beans. 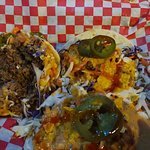 Choice of three meats, sliced beef, ham, turkey, or pulled pork. With two side orders, pickles, & white bread. B.B.’s lawnside BBQ’s meaty pork spare ribs are smoked slow & easy over a hickory wood fire in our 60+ year old pit. A perfect blend of not too sweet, not too spicy McGonigle’s Italian sausage served w/ your choice of two side orders. 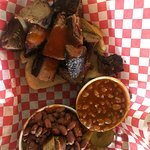 Tender chunks of beef burnt ends served w/ pit beans & battered fries. Farm raised fresh whole smoked catfish. Moist, tender & swimming w/ flavor. Served w/ our homestyle coleslaw & battered fries. Moist & tender. 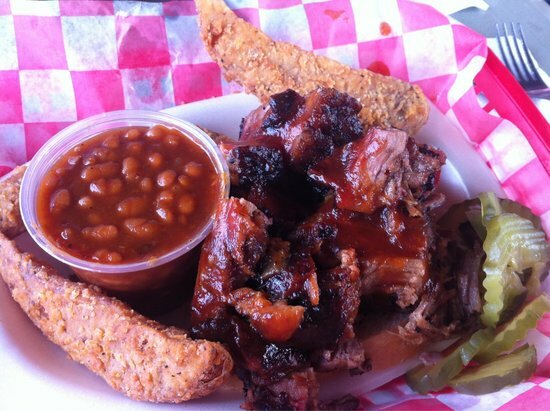 Slow smoked to perfection w/ B.B.’s own blend of spices. 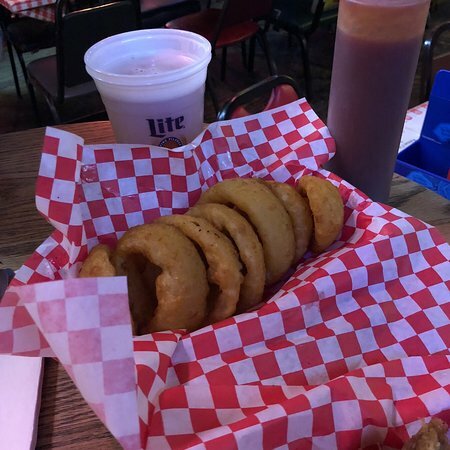 Served w/ your choice of one side order. For the‏ heartier appetite w/ the same great flavor. 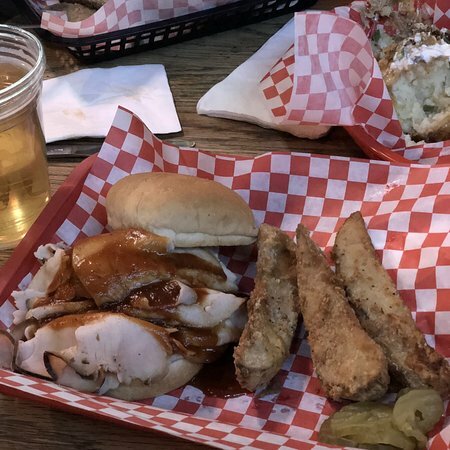 Served w/ your choice of two side orders. A generous portion of rib tips smothered in BBQ sauce & served w/ battered fries. Little hatch’s favorite! Unlike any other meatloaf. Ours is a blend of smoked beef brisket & ground beef w/ a hint of sweet BBQ sauce baked & served w/ green beans & skillet fries. B.B.’s very own, made from scratch raisin & vanilla bread pudding drizzled w/ a sweet bourbon sauce. Heavenly! New York style cheesecake on a graham cracker crust topped w/ glazed strawberries & ringed w/ non-dairy whipped topping. New York‏ style cheesecake on a chocolate cookie crumb crust, covered w/ a dark chocolate butter glaze & sprinkled w/ nuts & caramel syrup. 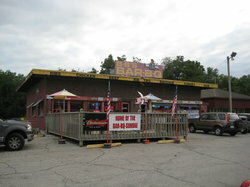 B.B.’s Lawnside BBQ serves a variety of beers, wine & soft drinks. خدمة رائعة. فريق عمل رائع. طعام لذيذ. 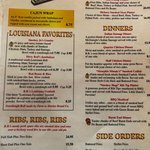 لقد أمرت Porker Pulled و Burnt Ends و Jambalaya Wrap. كانت هذه هي زيارتنا الثانية. فاصل ونواصل! كنا هناك ليلة الأحد من عطلة نهاية الأسبوع يوم العمل. كان الطعام والترفيه والغلاف الجوي ببساطة رائعة. لا يمكنني الأنتظار لكي أعود. غرفة ثلاثية و آخر محطة بالنسبة لنا. لقد تقريبا لم لأنها كانت جميلة في منطقة لطيفة ولكن لم يكن بذلك. الطعام شهي، كانت الخدمة جيدة جدا! ! تأكد من التوقف إذا كان لديك فرصة! أحب هذا الجو الشواء المشتركة! Super بالاسترخاء و تأخذك في الوقت. الطعام كان رائعاً و جيد كميات الموسيقى الحية على المرح المساء! 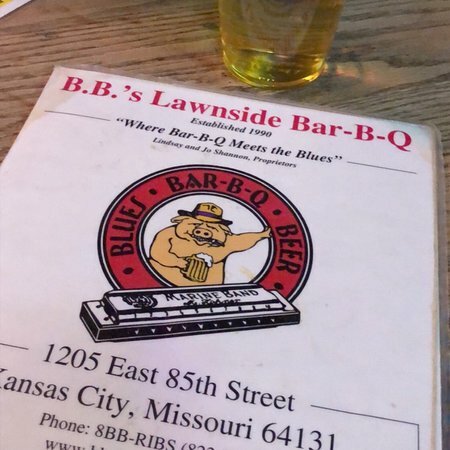 احصل على إجابات سريعة من موظفي ‪B B's Lawnside Bar-b-que‬ وزوار سابقين.